In October 2018, eight members of Scotland’s National Youth Arts Advisory Group (NYAAG) participated in the second half of their cultural exchange, called Transposition, with the Taenketank for Ungekultur (TUK) from Denmark. The aim of project is for each group to view each other’s cultures - and their own - from a different perspective and to work together to work what ideal youth culture looks like. Recently, the TUK group spent a week in Scotland following a programme designed by the eight members of NYAAG who participated in the exchange. In this guest post, NYAAG member Ellen Willson reflects on the experience. It was our feeling from the exchange that while Denmark has plenty of locally based initiatives for young people, such as culture houses, and cultural youth groups, there is a distinct lack of an overarching national structure to link them all together. In Scotland, however, we feel we have fantastic cultural resources at a national level but less local facilitation across the whole country. A number of our visits made this abundantly clear. 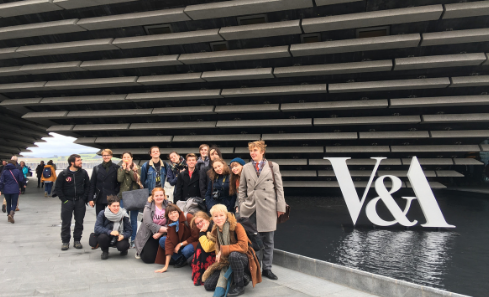 The newly constructed V&A Dundee is a nationally recognised institution that has opportunities dedicated to young people, allowing them to have an effect on how certain aspects of the museum are run. The Royal Conservatoire of Scotland has incredible spaces and resources for talented young artists to pursue the arts into a career and places fifth on the world rankings for performing arts education, showing how valuable its’ assets are. National funding bodies like Creative Scotland provide a large sum of money to arts and cultural projects, including many youth orientated ones. They also have a Creative Learning Team who fund projects that that benefit the education of young people through the arts. Young Scot also put young people at the heart of their decision making, having various groups tackling all sorts of issues and enabling them to make tangible differences nationwide. These national initiatives are really valuable to Scotland, for the arts and for young people. Something our Danish counterparts highlighted to us was how amazed they were at the inclusivity of Scottish culture. This was brilliantly illustrated during our visit to Sensatronic Lab: a youth-led project exploring new ways of experiencing music and electronics for those with disabilities. Based in Glasgow, it has seen fantastic success since it began, now offering outreach programmes within the Scottish Highlands and creating job opportunities for disabled young people within the organisation. It was hard not to feel overjoyed hearing about the success of the group. The Danish admired how in Scotland, we aim to embrace everyone of all abilities, especially within the arts and culture scene. Summarised beautifully by David McCluskey, who works for Sensatronic: "We don’t focus on their disabilities. Instead we look for their abilities." Stills Photography Studio aims to gather young people who faced barriers, such as geographical, financial or skills based, and provided courses intended to give a basic knowledge of photography before allowing them to experiment on their own. We visited the opening exhibition of the recent Stills Academy Graduates where I was completely in awe of the work they had managed to achieve despite all the barriers in their way. The focus on engaging those facing such distinct barriers to the arts is incredibly beneficial and the array of talent displayed at the gallery opening shows the amount of talent that could have been lost without such crucial investments made into youth arts. They made a point of including those who would not normally have been included and gave them the tools to create something beautiful. The ability to experiment is crucial for the engagement of young people in the arts. 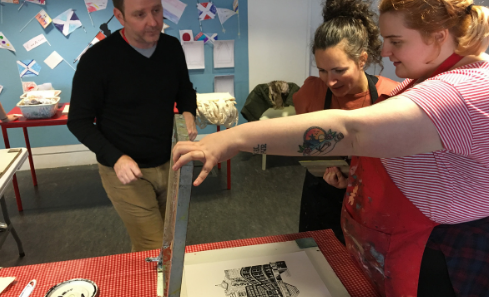 The Scottish National Portrait Gallery created a workshop space entirely dedicated to young people, experimenting with different mediums to interpret original pieces of art from the gallery. While there, I got to try out some photography; I had no one telling me how it should done; just time to play around with the tools I had to see what I could create. This shows the value of these creative experimentation spaces for young people. If they are instantly thrown into professional landscapes without any experience, they will not engage. Relaxed spaces dedicated to trying things out is what we need more of. 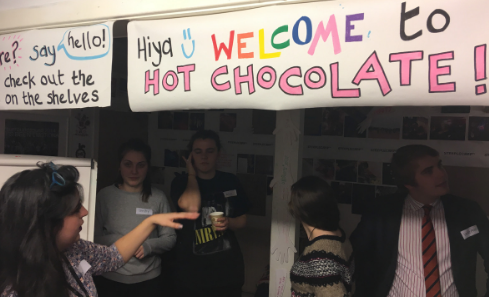 Hot Chocolate Trust in Dundee is also prioritises youth experimentation to professional work. They’ve transformed an old church into an open space for anyone to engage in arts projects. Music rooms, quiet spaces, even a sports hall - we were amazed by the facilities that they offered. We watched a video about the tough background of one of the young people who attended HCT showing how finding these safe spaces where you are free to express and experiment can sometimes be lifesaving to a young person who has taken a wrong path. Y-Sort It is in Clydebank, and further demonstrates the benefits of providing free open spaces to young people. We were treated to some clips of the youth creating their own dances, making crafts, trying theatre and even creating their own short film inspired by Ghostbusters. The focus is primarily on the wellbeing of the young person and ensuring that they are engaging in activities which will benefit them. Simply seeing the smiles of all of the young people in the videos made me see how worthwhile it all is. These particular visits taught me the importance of taking chances and trusting young people to experiment within the arts to find their area of expertise. Every young person has something special to offer and this should never be overlooked. What ‘Transposition’ has done more than anything throughout its duration is create a community. A community of like-minded people who would have been unlikely to cross paths any other way. While the project itself may be over, there is still plenty to do done digitally. We are currently in the process of writing up a report with all the details of our visits and findings so that our work will hopefully inspire others and give an insight into the incredible work we have undertaken in these few months. We also hope to maintain the connection between our two groups and we aim to potentially carry out future projects together.